It's been a little while since I read this book and I'm only just now getting around to writing about it. Terezin: Voices from the Holocaust is, as you might have gathered, another horrifically true story which comes out of World War II. Terezin was a small town in Czechoslovakia which the Nazi's turned into a ghetto/transient camp for Jews on their way to Aushwitz. (The Nazis renamed Terezin to Theresienstadt.) Many of the people in Terezin were artists and their talents were used for Nazi propaganda. The people in this camp were frequently forced to work in the Nazi studios, providing artwork for official reports, maps, charts, etc. In secret though, many of these same artists drew pictures which accurately reflected conditions in the camp. 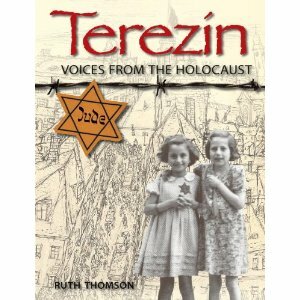 These pictures and stories are included in this particular book, Terezin: Voices from the Holocaust . The pictures are remarkable for many reasons, one of which is that the prisoners who illustrated them also had to hide them and keep them from being discovered from their captors. Most of the people who drew these pictures ultimately did not survive the war. They were eliminated, but their pictures were discovered and we can see what they endured at the hands of a perverse ideology. The pictures and drawings contained in this book aren't pretty or charming. Rather they show human suffering in some of its worse conditions -- at the hands of cruel and hateful men, driven by insanity. Terezin is laid out in a historical timeline. It introduces the younger reader to the concept of Hitler and his feelings towards the Jews, talks about the German invasion and occupation of Czechoslovakia, and explains how this camp ultimately came about. This book is ear-marked for "young adult" readers. Certainly the Holocaust is a delicate subject because of the horrors of war and the way various peoples were mishandled, tortured and killed. It was not a pretty time in history and so the pictures you will see inside this book are not beautiful, per se. Nor are they lurid as some you may see. Rather, they show people within the camps, looking malnourished and unhappy. There isn't anything terribly grotesque although the words which accompany each photograph try to educate the young reader about what was truly going on inside Germany, inside Czechoslovakia, inside the lives of countless people. I think this book is tasteful in how it relays facts and information to the younger reader, opening their eyes to the history of the world around them. That is important. We shouldn't sweep history under the rug just because it's ugly. Rather, we should tell stories and teach and learn from the past so that we can apply truth accurately in the future - hopefully avoiding anymore atrocities such as those that occurred under Nazi rule. I heartily recommend this book as a rather gentle entry into the history of World War II and what was suffered, specifically in Terezin. Thank you, Candlewick Press, for providing us with such a resource for our younger audience and for sending a copy my way to check out! What--no giveaway?!?! ;-). This is a book I'd like to see! One of my projects in library school was on holocaust literature. This sounds like a fantastic book. After reading The Lost Wife by Alyson Richman and loving it (it's set partially in Terezin), I'm definitely adding this to my to-read list. I will link to your review on War Through the Generations.